The See (or Diocese) of Sherborne was created in AD 705 when the great Diocese of Winchester was divided in two, and Aldhelm, Abbot of Malmesbury, was appointed as the first Bishop of the West Saxons. Aldhelm chose the place of the Scire-burne – the ‘clear stream’ – as the site for his seat, or cathedra. 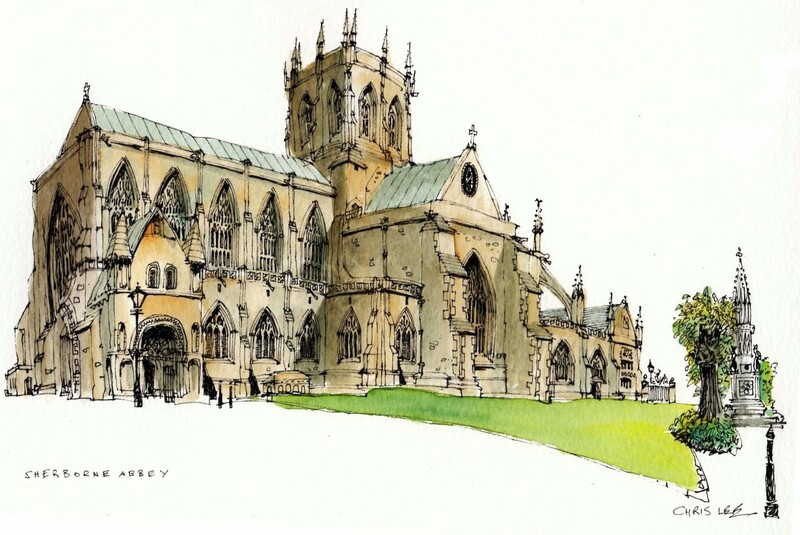 The new Cathedral of Sherborne served St Aldhelm and twenty-six succeeding Saxon Bishops. Small at first, it was later enlarged. A few important early features still survive (when you come into the Abbey, see the fine Saxon doorway in the NW corner). However, soon after the Norman Conquest the Bishop’s seat was moved to Old Sarum, and later Salisbury. Earlier, in 998, St Wulfsin had ejected the community of secular canons who served the Cathedral, and invited monks of the Order of St Benedict to replace them. Sherborne Abbey remained a Benedictine house until 1539 when Abbot John Barnstaple and his sixteen fellow monks surrendered it to King Henry VIII. Relations between the monks and the people of Sherborne were not always good, which is why the best place to begin a visit to the Abbey is to walk round the outside to look up at the West End. It was here that the Church of All Hallows was built by the monks, actually joined to the Abbey itself. To the left and right of the West End the ‘joins’ can still be seen. This smaller church was for the use of the townspeople – who always resented being pushed out of what had once been ‘their’ church. Tensions between the monks and the town came to a head in 1437 when the people decided they had had enough of having to go cap in hand to the Abbot every time they wanted to use the font for a baptism, and decided to erect a font of their own in All Hallows. The Abbot was enraged, and according to the contemporary chronicle sent a ‘stout butcher’ armed with a hammer into the smaller church to break the font. This caused a riot, during which a burning arrow was shot into the east end of the Abbey, at that time full of wooden scaffolding for the rebuilding of the roof. The fire that resulted permanently reddened the walls of the quire and the crossing. It took the Pope himself to settle the conflict – and the people had to pay for the repairs! No wonder that at the Reformation they were delighted to regain possession of what has ever since been their parish church. They immediately pulled down All Hallows as being surplus to requirements. Ironically, as you now enter the Abbey by the SW porch, you will see not only a large Victorian font just inside the door, but if you look straight down the south aisle you will see in the distance another font, in the Bow Chapel. The bowl of this is clearly medieval, and just possibly all that remains of the broken font from All Hallows. But do not walk down to look at it yet. Instead go to the west steps and look up at the fan-vaulted roof. This is the earliest great fan-vaulting in England, and possibly the finest. Walk slowly down the centre of the nave, looking up as much as possible. Then when you reach the quire steps, turn back to look at the Great West Window. By the eminent stained-glass artist, the late John Hayward, this was dedicated in 1998 at a service attended by HM The Queen and HRH The Duke of Edinburgh. In the quire itself you can see the medieval misericords in the back stalls on either side (please do not handle them) and the painted ceiling, glorious coloured glass and fine reredos of the mid-19th century restoration. If you go out of the gates on the north side, you can then walk round to see the Lady Chapel, with its fine engraved glass reredos by Lawrence Whistler. The Bow Chapel with the second font is on the right. If you now walk down the south quire aisle you will come to the doorway of the Sepulchre Chapel. If entering this, please mind your head and also enter quietly – this chapel is reserved for private prayer. There is a book here in which you can write your own prayers. They will also be offered at our daily services. Emerging from the Sepulchre Chapel, pass through the archway on your left to the south transept, sometimes known as the Digby Chapel. Here is a fine monument to John Digby, Third and Last Earl of Bristol, and his two wives. He played an important part in throwing Dorset behind William of Orange at the time of the ‘Glorious Revolution’ in 1688 which led to the flight of King James II and the accession of William and Mary. Move next to St Katherine’s Chapel which contains most of the Abbey’s surviving medieval glass, and the fine Leweston monument. Then cross over to the north transept, under the organ, and look at the Horsey monument on the right. Sir John Horsey was the man who bought the Abbey estates from the Crown at the time of the Reformation. The massive release of monastic lands led to many a rich merchant acquiring a great country estate at a knock-down price and contributed to the rise of a gentry class in England. Look at the effigy of Sir John and his son. This tomb is only twenty years earlier than that of Sir John and Lady Leweston and yet the two Horseys appear to be wearing the armour of a century earlier. Are they trying to suggest a longer pedigree than perhaps was the case? When you visit the Abbey, enjoy the tour – and do visit the Abbey Shop in the Close! Above all, please do not leave without adding your own prayers to those that have been offered here for over thirteen centuries. Excerpt from www.sherborneabbey.com – visit the website for more information.